I previously got a 4/8 Sharpen that I put on my Spirit Mage for no other reason than it was better than what he had, but, if 5/8 would be better for any specific hero, I'm willing to upgrade. I don't have Skeletica. But on another note, please be sure to lock your hero...the padlock to the left of his name. This way you don't accidentally consume him. Thanks for that padlock notafication, i don’t really know what happend. I always lock my hero’s, he is still locked and the picture showed he’s not. I think, because I put it on skelly, that everybody these day’s wants all their hero’s in dodge. The only way to get that dodged hero’s killed, you have to use crits/crits damage, so in that way the dodged hero’s doesn’t stand a chance. That’s why I like that sharpen with good traits roll on my skelly. Feedback on Android platform is that it is a beast on Athene. Thanks. I wish I had her. No such luck yet, unfortunately. I think that's the feedback to which FL is referring. My sharpen experience isn't good. First off, crit itself is limiting. 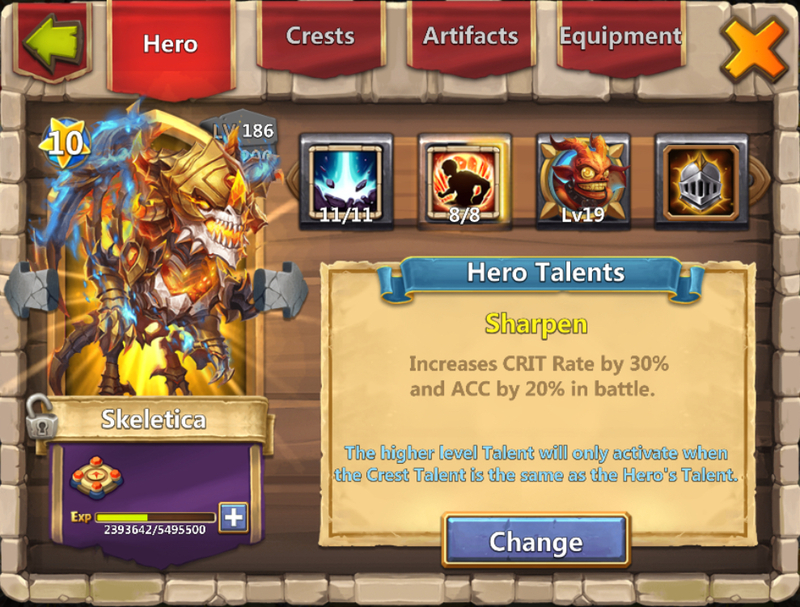 This talent doesn't increase crit damage, it only increases crit chance. Second off, ACC, while nice, isn't something that is all that important for most players. It comes in handy if you are head to heading max dodge heroes, but that isn't common by any means. I am going to say, the vast majority of players, have virtually no additional ACC on any of their heroes, and don't really need it. Conclusion: Crap. It's especially bad if left at 5/8. Sharpen might have a place, and it can be effective under certain situations, but those situations are not what I would consider common. I was also thinking Axe of Strife is similar. I think this talent is too new yet. I'll put on a subpar hero with nothing better and play around with it. Thanks for your thoughts. 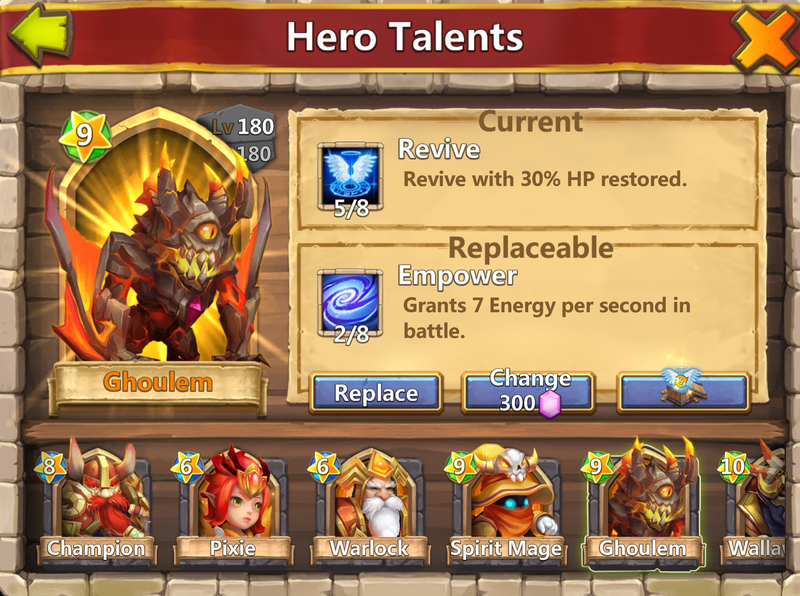 So I put Sharpen on another hero, roll for my quest and get this!! Sheesh...any thoughts on Sharpen for a hero? I know 2/8 is pretty sucky, but, since I've got it, thought I'd ask...just in case I get a 5/8 one day. I believe that that empower, will do nicely on athene. She will almost continually proc and she gives energy to the other hero’s. If I got a 5/8 empower I would certainly put that on her. Empower is both grossly overpowered, and relatively mediocre all at once. Empower is great for base defense modes like GW defense and IS. GREAT. However, it rolls downhill for immediate Head to Head combat like LBF. Still a great talent, and a worthwhile pull. But its not the greatest talent on earth.